To be honest, I haven't even started to really decorate for fall and it is already getting close to the middle of October. Every time I go into my basement, I see the orange and black rubbermaid tote and think that I really need to at least bring it upstairs so I can start to decorate. It is pretty pathetic. To help get in the spirit of decorating for this season, I made these really cute and super easy candle displays. It was inspired by a pin on Pinterest, which turns out to just be a picture. But I think the concept is easy to grasp without a step by step tutorial. Start to finish, this took about 5 minutes total. 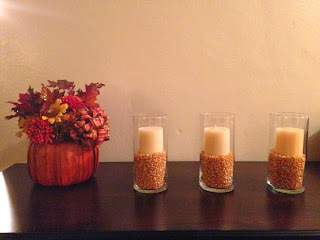 I used glass vases and candles from Dollar General, which helped keeping this project on the less expensive side of DIY decorating. Let's be honest, some of these inspirations can get pretty pricy. 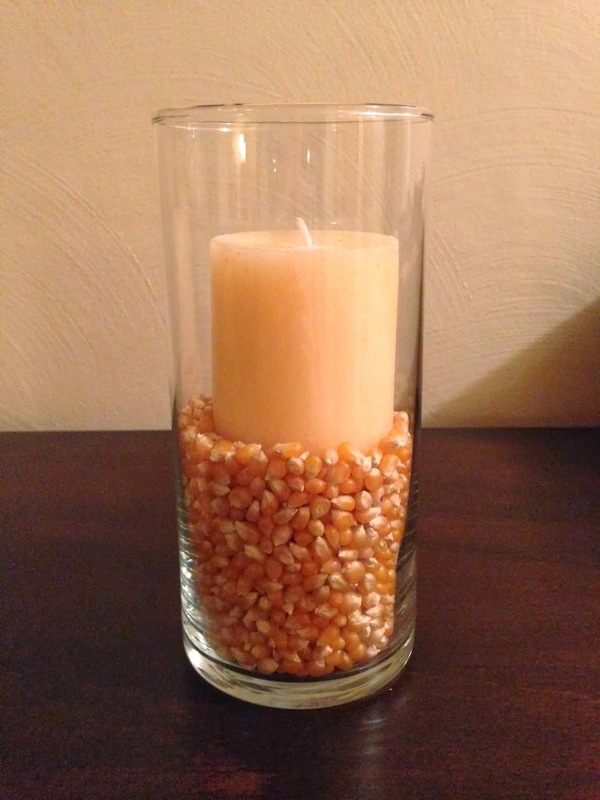 I dumped some corn kernels inside the vase and nestled the candle on the top. You can push it into the kernels a little bit so you don't see the bottom of the candle. And it is done! I don't know exactly where I am going to put them, but at least it is one more thing I can check off my autumn to-do list!